Sudden Unexpected Infant Death (SUID) is the leading cause of death for babies 1 month old until 1 year old in Virginia and nationwide. Almost all of these deaths occur while the baby is sleeping. The studies from these deaths have revealed ways to keep babies safe while they sleep and have shown that these deaths can be prevented. There are things that parents and caregivers can do to protect babies from SUIDs and many things that parents and caregivers should not do. It is important to talk to anyone taking care of your baby about the steps for Safe Sleep. Always place your baby on his/her back for every sleep—naps and bedtime: Until their first birthday, babies should be laid down to sleep on their back every time they go to sleep. Babies who sleep on their backs are less likely to die of SUIDs than babies who sleep on their stomachs or sides. This is different from how babies used to sleep, but it is one of the most important. Once your baby learns to roll over you should still lay them down to sleep on their back, but you can leave them on their stomach if they roll over while sleeping. Parents worry that babies will choke when sleeping on their backs but this is not true. Babies automatically cough up or swallow fluid that they spit up or vomit—it’s a reflex to keep the airway clear. Some babies may have a medical reason they cannot sleep on their back; always follow your doctor’s advice. Studies show no increase in the number of deaths from choking among babies who sleep on their backs. In fact, babies who sleep on their backs might clear these fluids better because of the way the body is built. Use a firm sleep surface: A baby’s bed (crib, bassinet, portable crib, or play yard) should be safety-approved and used with a tight-fitting, firm mattress and fitted sheet made for that product. No additional padding should be added to the crib, bassinet, portable crib, or play yard. Do not put anything (pillows, blankets, stuffed toys, or crib bumpers) anywhere baby’s sleep area: Babies can move around in their sleep and get trapped or tangled in extra items lying in the crib. Crib bumpers have not been shown to prevent injuries. In fact, crib bumpers can cause serious injuries and death. Babies should not sleep in an adult bed, on a couch, or on a chair alone, with you or anyone else:Babies who sleep on soft surfaces are more likely to die of SUIDs. Babies should not sleep in swings, car seats, or carriers: Babies can fall asleep for short periods of time in swings, car seats, and carriers; however these should not be the place for everyday sleep. Babies are at risk for strangulation from the device’s straps and positional suffocation if their head falls forward. Babies who fall asleep in swings, car seats, and carriers should be removed and placed on a firm sleep surface, for example: a crib, pack-n-play, or bassinet. Have your baby share your room, not your bed: Room sharing—keeping baby’s sleep area separate from your sleep area in the same room—reduces the risk of SUIDS. Keeping the baby’s sleep area next to you makes it easier to feed and check on your baby. If you bring baby into your bed to feed, make sure to put him or her back in a separate sleep area in your room next to where you sleep when you are finished. Do not let your baby overheat during sleep: Overheating while an infant is asleep has been found to increase the risk of SUIDs. Keep the room at a temperature that is comfortable for an adult. Dress your baby in no more than one layer of clothing. Blankets can cause a baby to overheat, instead use them as decoration in the room. A one-piece sleeper or sleep sack can be used for crib clothing. If you notice sweating or rapid breathing, he or she may be too warm. The use of a fan has not been shown to decrease the risk of SUIDs. 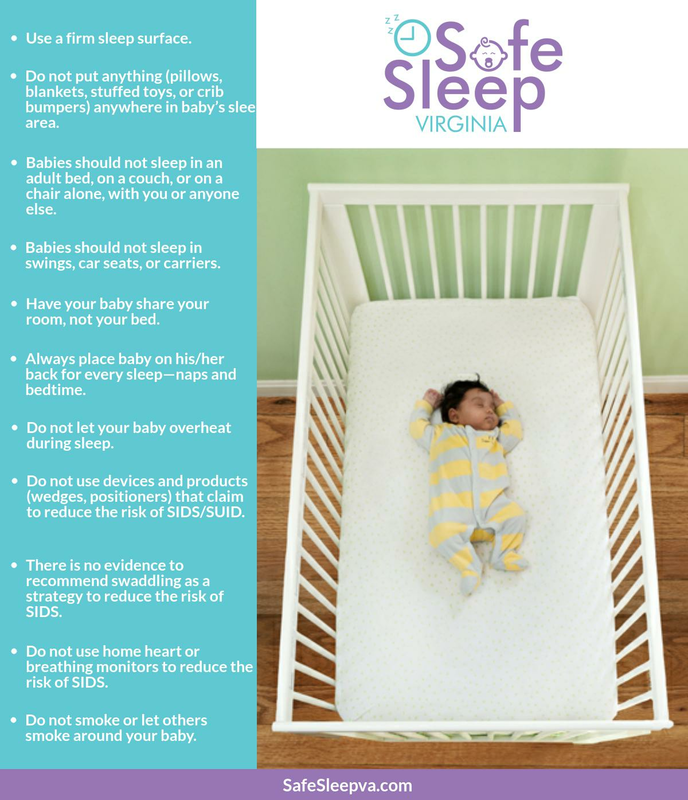 Do not use devices and products (wedges, positioners) that claim to reduce the risk of SIDS/SUID: Wedges, positioners, and other products have not been tested for safety or effectiveness. These devices can cause injury and death. There is no evidence to recommend swaddling as a strategy to reduce the risk of SIDS: There is not enough evidence that swaddling reduces the risk of SUIDs. In fact, the blanket can become dangerous if the swaddling loosens. Do not use home heart or breathing monitors to reduce the risk of SIDS.If you have questions about using these types of monitors for other health conditions, talk with your baby’s doctor. Do not smoke or let others smoke around your baby: Smoking and exposure to smoke while you are pregnant can cause your baby to be born early, be very small, and other health problems. Once your baby is born, it is important to keep your baby away from smokers and places where people smoke. Exposure to smoke has been found to increase the risk of SUIDs. As of July 1, 2017, Virginia has a new law that prohibits smoking in a car, moving or stopped, with children under the age of eight. Free help is available to anyone who wants to end tobacco use through the Virginia Quit Now Program. There are trained staff to work with pregnant women and new moms who want to stop smoking. Many people are interested in using a Baby Box as a safe spot for a baby to sleep. It is important to remember that the Baby Box is only part of ensuring that your baby has a safe sleep environment. At this time, there is not enough information to know if a Baby Box can help prevent SUIDs. Never move the Baby Box with your baby in it. Always place the Baby Box on a firm, flat surface, such as the floor. Only use the bedding that comes with the Baby Box to ensure a snug fit. Keep the Baby Box away from an open flame. Do not let the Baby Box get excessively wet, do not leave out in the rain or place in the bath tub. Never use the lid while your baby is inside. Baby Box University is a platform established by The Baby Box Co. to provide expecting and new parents with universal access to educational resources and a support system. Baby Box University includes short form videos, articles, an ‘ask an expert’ feature, e-books and more. *Disclaimer: The views and opinions expressed by The Baby Box Co. are those of the authors and do not necessarily reflect the official policy or position of the Virginia Department of Health.